The Cold War marked a shift in the strategies and tools nations used to achieve tactical goals. While state-sponsored efforts in Germany, Japan, and Britain during WWII may have ushered in the weaponization of broadcast media, it was during the Cold War, a conflict of ideas and ideologies with no physical battleground to speak of, that information and its dissemination became the defining armaments of choice. Radio in particular lost its innocence entirely as networks from competing sides battled for airspace, reception, relevancy, and influence. A web of narratives and counter-narratives, even the most objective broadcasters could not help but participate in this profound cultural moment. So it follows, then, that in order to piece together when and how news of particular historical events became available to particular regions, one must investigate reports from multiple networks. 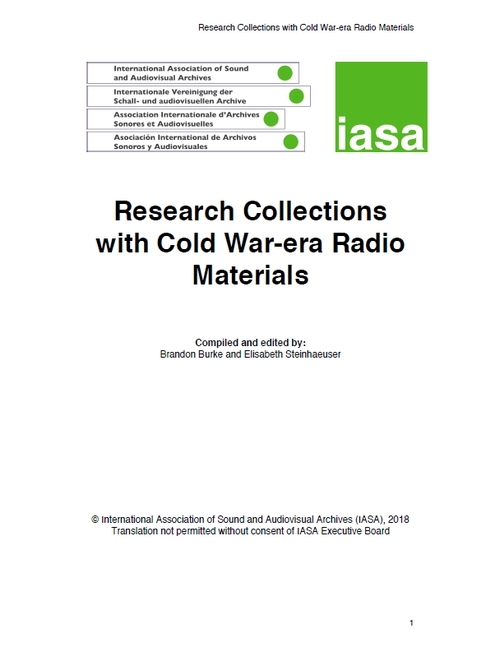 Research Collections with Cold War-era Radio Materials is a subject guide containing profiles of broadcasters and collecting institutions (national libraries, national archives, universities, historical societies) with materials documenting or otherwise pertaining to radio production during the Cold War. It is limited in scope to organizations whose materials are available, if restricted, and does not attempt to identify, describe, or otherwise account for collections or materials that are closed to the public. The broadcasters and institutions listed in this document supplied and/or approved the information in their profiles. Research Collections with Cold War-era Radio Materials is collaborative effort between the Broadcast Archives Section and the Cold War Communication Project of the Library of Congress Radio Preservation Task Force. The authors wish to thank the International Association of Sound and Audiovisual Archives (IASA), the Library of Congress, the Hoover Institution Library and Archives at Stanford University, Ross Johnson, Martins Zvaners, Jane Curry, and Brecht Declercq for their support and assistance. To submit information about Cold War-era radio collections for inclusion in future versions of this document contact: Brandon Burke (brburke@stanford.edu).